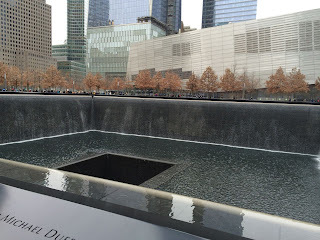 During my recent visit to New York City, I had the opportunity to visit the National September 11 Memorial that rests on the site of the former World Trade Center buildings attacked and destroyed in 2001. It was a fittingly cold winter day when I toured the site. I had not been back to the site for a number of years so I really was not sure what to expect. I was surprised and touched by the crowds of visitors taking the time in this holiday season to wait patiently in the bitter cold to visit the site. My first glimpse as I cleared security and walked through the maze of nearly 400 swamp oaks was of the former site of the South Tower of the two buildings. My first thought as I gazed was 'it reminds us that this is a gravesite - how appropriate.' Water cascaded down the sides of the memorial and into a seemingly bottomless pit. The edge of the memorial is etched with the names of those who died on that day. 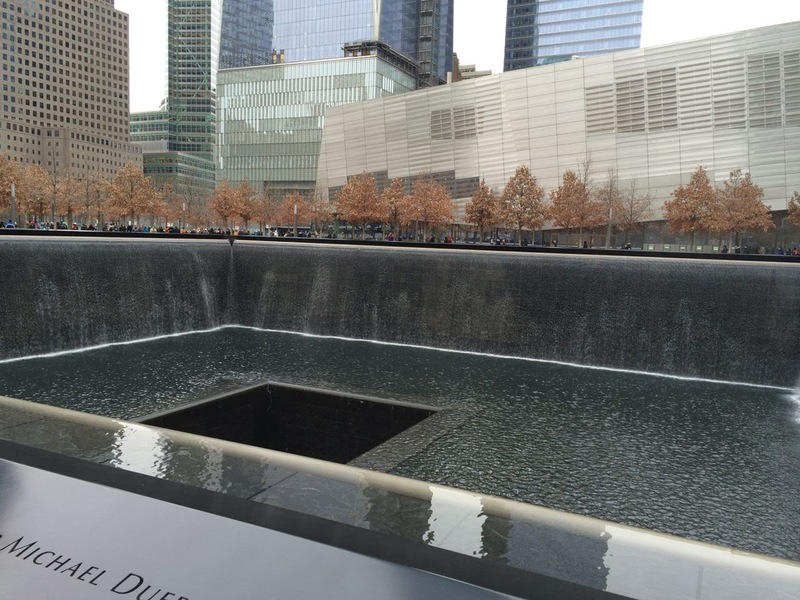 The footprint of the North Tower has a matching memorial. The names include not only those who died in the two towers but also those who died in the Pennsylvania field and in the 1993 attack. Rising near the South Tower is the new tower that has been constructed. In juxtaposition to the two footprint memorials is the the site where a museum is being built. I walked away from the Memorial with two memories embedded in my mind. 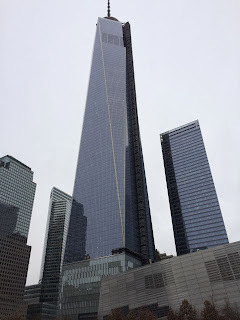 One was of a sight at the South tower memorial. Someone had placed a plastic white rose bud in an indentation that separated the lists of names. It reminded me that each of these deceased had a family that is still grieving in this holiday season. I had thought perhaps that visiting the Memorial would bring me some more closure to the event on that fateful day. As I walked through the Memorial I appreciated that there really is no such thing as closure. We simply continue in life, looking back on events with changing perspectives. The second memory is of The Survivor Tree that stands in the plaza. 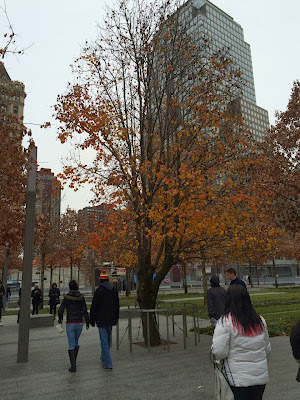 It is a callery pear tree whose remnants were pulled from the wreckage of the buildings and nursed back to health. It has become a living reminder of resilience, survival and rebirth. I tried to share a video on the tree that I found on the Memorial website but I can't seem to get it to upload. Instead, here is a link to the page where I found it. It tells an inspiring story so I hope you will check it out. Here is hoping that 2014 will be a time of rebirth and healing for everyone. It is my fond hope, Judy, that you (the collective 'you' in the US) will also remember your friends...those of us (nations) who stood by you, took you in when you couldn't get home, and tried to help you through that very hard time. We outnumber your (collective 'your') enemies.